The chihuahua is the smallest dog breed in the world and there are really only two types of chihuahuas. They are either apple heads or deer heads and may be smooth haired or longhaired. Chihuahuas come in all sorts of colors and sizes and the only defining factor as far as conformation show standards go is the weight of the dog. Consequently, the height of Chihuahuas varies considerably more than in other breeds of dog. Even though there is no genetic difference between a smooth haired and a longhaired chihuahua, these are the only two varieties recognized by both the Kennel Club in the UK and the American Kennel club. Smooth-coat chihuahua. These dogs have short hair, but despite their names may not be smooth at all. Their coats may be very soft or have a more wiry feel. Long-coat chihuahua. 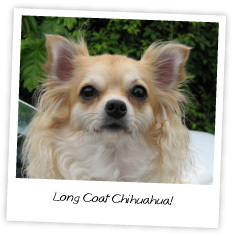 The longhaired chihuahua has a very soft and smooth coat, smoother in fact than its shorthaired counterpart. The guard hairs are long, fluffy and fine and the undercoat is downy. Surprisingly they shed less than the shorter haired, smooth-coat chihuahua. They don’t need a lot of grooming and require no trimming. It may take a couple of years for the long coat to grow to its final length. Apple head chihuahua. This is the most common chihuahua. The shape of the apple head puppy’s head gives rise to the name. The skull is wider than the jaw and the forehead rises abruptly from the nose. The top of the head has a small indentation in the middle. All of this contributes to the apple shape and appearance. They generally have protruding eyes, smaller bodies and bigger heads than deer heads. Deer head chihuahua. Any chihuahua that does not have the characteristic apple shaped head is referred to as a deer head. Similar looking to little deer, this type of chihuahua has a sloped forehead and a smaller head, which is elongated. They tend to be taller and thinner, with more delicate fawn like paws. Their noses are also longer. Tea Cup chihuahuas are not types of chihuahuas at all. Not recognized. Tea Cup Chihuahuas, also referred to as Tiny Toy, Pocket sized, Mini or Miniature Chihuahuas are not recognized breed standards. Gimmicks. Breeders have attempted to produce the smallest dogs possible to persuade people to part with their money. 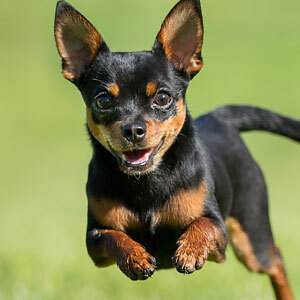 These dogs are just smaller than other Chihuahuas with a bigger price tag. Chihuahuas come in a wide variety of colors and markings and no color is more valuable than any other. Common colors. These are red, fawn, cream, chocolate, blue and black. Solid, spotted, splashed. Chihuahuas can have solid black to solid white coloring and anything in between or a combination of colors, patterns and markings. There are many variations in chihuahua height, weight, size and color, as well as fur and head type. It seems surprising then that there really are only two types of Chihuahuas.